Home News Spring Market Survived Mother Nature’s Onslaught! What a fabulous Spring Market we had, despite the wind, cool temps and RAIN! Gardeners turned out in force to welcome the hoards of buyers who braved the conditions. 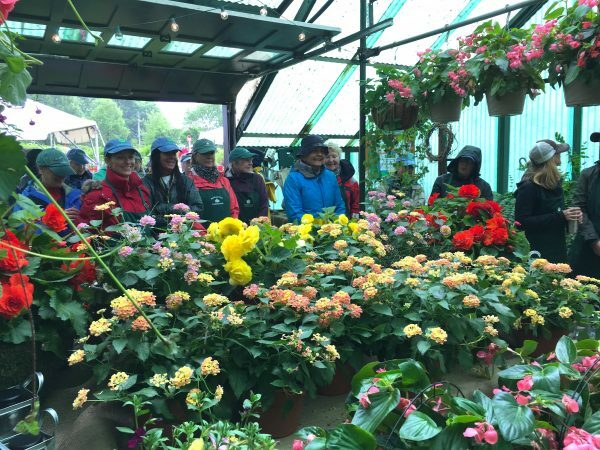 Full of smiles, helpful advice and toting strength, Gardeners spurred sales and happy customers. We did have some prime items remaining at the end of the sale and will be scheduling an after-market sale this coming week…stay tuned! In the meantime – just take a look at a section of our geared up and ready to go sales force! Believe it or not, they were quite a bit wetter but still smiling at 1 pm when the sale ended. All net proceeds benefit our community, allowing us to maintain and develop public gardens, present garden-inspired programs for all ages and build environmental awareness. Some prime plants and planted containers remained after the sale concluded and we will be offering them for sale one day this week (when it’s not pouring! )…stay tuned! http://charlotteskitchendiary.com/2012/08/30/a-spaghetti-carbonara/ Become a Rowayton Gardener!